A group of third and fourth graders giggled with excitement as their yoga instructor guided them into the “tripod” position, where students place their heads and hands at the center of the mat, bend their knees, and lift their bodies up. “Computing is a difficult field. 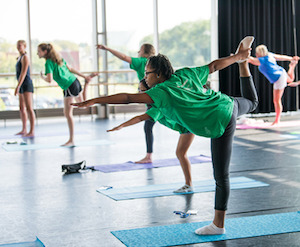 Solving those problems can be mentally challenging, so having a wellness practice like yoga is a great life skill,” said Lisa Schlossnagle, Founder and President of HowGirlsCode Inc.
Yoga Instructor Emily Kirshenbaum told Diverse, yoga not only opens their minds to trying new things but it also teaches the girls how to get the same results in their programming and coding through using different paths. HowGirlsCode “Mind, Body, and Coding” summer camp, held on the campus of University of Maryland Baltimore County, is a computer science and coding camp for girls ranging from the 3rd to 9th grades. This is the third year the organization is hosting its summer camp. The one-week camp teaches students how to code and create robots through various art-themed activities to advance their STEM skills. “HowGirlsCode after-school classes and summer camps give elementary age girls experience with computer science and coding before fixed notions of what interests them or what careers they might see themselves in take hold,” Schlossnagle told Diverse in an e-mail. Students are separated by grade levels; 3rd and 4th graders are in one group where they learn to code animations and art using a program called Tynker, and create dancing LEGO robots. Fourth grade students Abisola Osho and Makayla Downs worked together in creating their own robotic dancing ballerina, after creating their first robot, Milo,that only moved back and forth. “We wanted to make a ballerina out of it because we wanted it to dance, since ballerinas dance and twirl. We thought maybe making a ballerina would actually help,” Osho said. Fifth and 6th grade girls participate in the same activities on a more difficult level using Scratch programming, and Lego Mindstorms EV3 robots. Girls in 7th to 9th grade build and program robots using Lego Mindstorms EV3 robotics, and learn how to build and program using Java programming. Students engage in a many challenges that allow them to practice and perfect their coding skills. One of the many challenges is the “line challenge,” in which they were separated into teams, and have to program their robots to go in a straight line and back. A few students were frustrated when their robots did not turn around completely, but they did not give up. The program is focused on increasing diversity in the field of STEM. “HowGirlsCode exists to address the issue of diversity in STEM at the start of the pipeline — elementary school. While our country has never had gender equity in computing studies and careers, the disparity has grown larger over the last 30 years,” Schlossnagle said. Outside of the summer camp, HowGirlsCode is an after-school program that began in February 2014 as a club with the daughters of Lisa Schlossnagle in their home. Later Katie Egan shared her long-held dream of having a computer-science based after-school program. With the help of a UMBC professor and elementary school teacher, they began the program that has increased to 18 classes among several Howard County Public Schools. Ya-Marie Sesay can be reached via e-mail at ysesay@diverseeducation.com and on twitter @Sesayyamarie.